Jan 22: The Piaggio APE is a good three-wheeler, which is pretty decent to carry low weight cargo. It is equipped with a single cylinder, water-cooled, BS-IV compliant engine with a capacity of 395cc. This engine is capable of churning out a maximum of 8.04 hp power along with a peak torque of 22.2 Nm. The power is channelled to the wheels via a 4-speed manual transmission. The vehicle comes with an 18.13 litres of fuel tank capacity and the mileage is around 36 kmpl. It has a wheelbase of around 2,100 mm and the ground clearance is 165 mm. It comes with a GVW of 975 kg, out of which 494 kg is the maximum payload capacity. The mini truck gets disc brakes along with parking brakes to deal with the stopping power. It comes with a deck body and a day cabin built on the chassis. Pros: Good and easy to drive in city traffic. Best in class milage. Lower maintanace cost. Value for money. Easy operatablity Cons: No back weight, lifts the front of the vehicle if loaded heavy in the back. Gives arm pains due to seering type, since holding the handle and due to one side shock absorber, arms are getting much pressure, which makes life more hard. 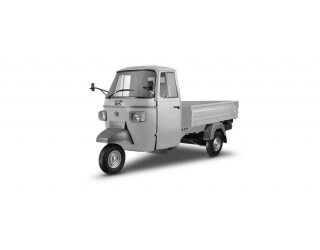 Piaggio ape is the very Good truck for picking up Materials and routine work, it is a very cost effective truck and Pick up is very good. Sometimes vehicle gives vibration. Save Rs. 1 for each 1-kilometer. its will help you to avoid big expense at the time of Vehicle service. Piaggio Ape is referred to as India’s leading three-wheeler LCV (Light Commercial Vehicles). The vehicle is based on a Vespa scooter and is highly recommended by small business owners for its superb performance. The Ape was first launched way back in 1948 at the end of World War II to fulfil the transport needs. It comes in many configurations and is used for different purposes, be it for light cargo movement or goods carriage. The small truck has scooter-styled handlebars for its three-wheeler body and was originally designed for one person, though it can accommodate a passenger in the cab now. This affordable vehicle is easy to be operated and is offered in seven body colour options, such as orange, green, blue, white, yellow, and red. Recently Piaggio launched a new range of the Ape in Gujarat with a water-cooled engine, including the Ape Xtra LDX and Ape. The newest range priced from Rs. 2.13 lakhs to Rs. 2.18 lakhs (ex-showroom prices). The Piaggio Ape mini truck is powered by a 0.4-litre water-cooled, single cylinder BS-IV compliant engine that can churn out a maximum power of 8.04 bhp at 3,400 rpm, along with the highest torque of 22.2 Nm at 2,000 rpm. The produced power is channelled through a 4-speed manual gearbox with the help of a multi-disc wet type clutch. Though the power and torque seem to be a little too low, the dimension and weight allow it to have decent performance. The fuel efficiency is also on the better side as the engine returns with a mileage of around 36 kmpl. The Piaggio Ape is generally used to carry loads light like food items and more on both urban roads and hilly roads. Hence, the cargo deck is decently sized and there is a day cabin too. Though the cabin looks a little small, it can accommodate a co-driver along with the driver. The three-wheeler truck has an overall length of 3,110 mm, while the wheelbase stands at 2,100 mm. The gross vehicle weight is on the lighter side with 975 kilograms. This makes for 481 kilograms of kerb weight and 494 kilograms of maximum payload capacity. The Piaggio Ape has an off-road gradeability of 18%, which is decent for a three-wheeler mini truck with such a setup. It comes with 165 mm of ground clearance, which works decently on bumpy and bad roads. However, off-roading is not an option here. The mini truck features Helical spring with a hydraulic telescopic shock absorber at a front wheel, while on the rear wheel, there is a Rubber Compression with a hydraulic telescopic shock absorber. The suspension does not have a lot of travel, especially on the front wheel. However, the stiffer suspension setup helps the truck to maintain stability on the road as anything more bouncy would get it off its wheels. The Piaggio Ape gets disc brakes doing the stopping duties. The brakes are pretty good and are in-line with the kind of power and weight that the mini truck possesses. And just like anyone would imagine, it does not have ABS for its brakes. However, parking brakes is a very worthy addition. The mini truck does not have very rich safety equipment and it cannot be blamed as well. The extremely low price tag and small build take away the inclusion of seat belts and the truck does well without. The Piaggio Ape three-wheeler mini truck isn’t the most attractive looking model but it gets the job done. There are extra additional mudguards for all the wheels. The suspension setup is better and is tuned just enough to keep the road stability intact. Inside the day cabin, there is just a D+1 that isn’t the most spacious of the lot but good enough for short city hauls. The handle-type steering makes it easy to pass through busy city roads and stuffed streets.